We joined a guided tour of M/V GLOBAL HIGHWAY, one of our largest RORO vessels, held at Tokuyama/Kudamatsu Port in Japan on March 20, 2017, inviting citizens of Kudamatsu City, Yamaguchi Prefecture. A total of 209 people, mainly from elementary school children as members of Boy Scout Federation and Rotary Club, participated in the tour. The donation of 450,000 Yen consists of participation cost collected from each participant plus donation from three private companies, namely "K" LINE, HTS and KSK as sponsors of the event. Kasado Works of Railway Systems Business Unit of Hitachi, Ltd. in Kudamatsu City is a manufacturing plant of high-speed rail cars being exported to the UK, and our large RORO vessels call at Tokuyama/Kudamatsu Port once a month to accommodate those rail cars. Our RORO vessels have drawn great interest from citizens of Kudamatsu City due to their huge size and brilliant design. Our intention is to show how the railcars made in Kudamatsu City are loaded onto vessels at their local port, and we think this kind of event contributes back to a local area where we usually get a lot of support. We have already held this kind of event several times. 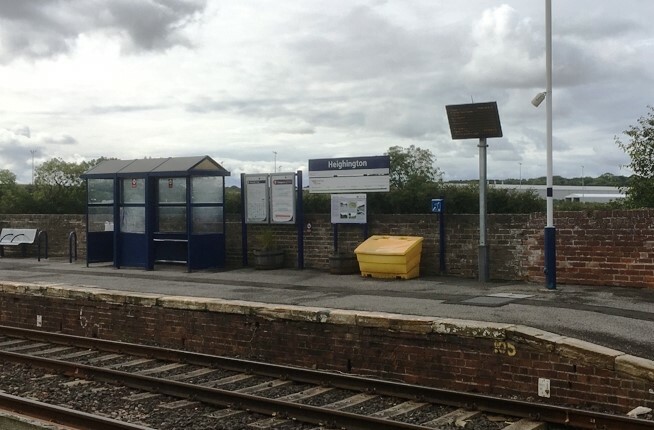 Heighington Railway Station lies on the route of the Stockton and Darlington Railway, the world's first passenger railway line. The station's historical claim to fame is that the first train on that line, the Locomotion No.1, was assembled here in 1825 before starting on its first journey. The station is located very close to Hitachi's Newton Aycliffe rail vehicle manufacturing facility. Employees from the facility are now voluntarily involved in setting up the restoration project of the station which is old and damaged, so we made up our mind to give a donation to this project. We think this is a meaningful project in view of the fact that it connects the past to the present railcars which we are now transporting. 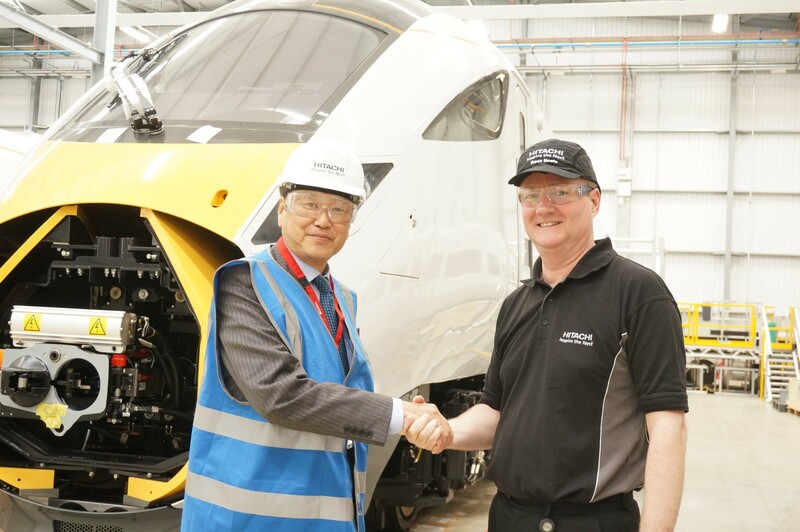 At Newton Aycliff plant of Hitachi Rail Europe, Ltd. Right: Mr. Ross Nagle, COO at Hitachi Rail Europe Ltd.